This is another easy "clean-out-the-pantry" recipe - Inside Out S'mores Brownie Bars. 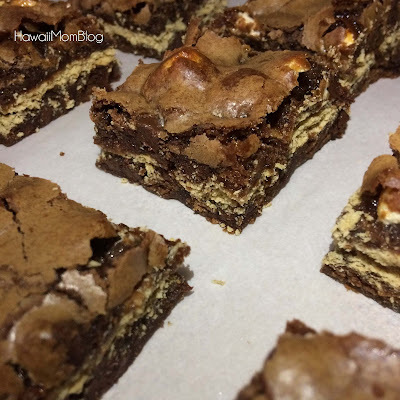 The graham cracker and marshmallow center really makes this brownie super yummy. For the brownie layers, you can use your favorite brownie mix (x2), but I used this super easy brownie recipe. Once you make your brownie batter, spread half into a prepared 9x13 pan. Place a layer of graham crackers onto the brownie batter (I used about 8 rectangles - break into pieces as necessary to fit the pan), then sprinkle 3 cups of mini marshmallows atop the graham crackers. Pour the remaining brownie batter on top of the marshmallows, and bake at 350 degrees Fahrenheit for 25 minutes.